Simply Shopping is a shopping list app that simplifies your shopping experience. You will never need to create groceries or shopping list over and over again. All you need to do is check items from the 'main list' to add to your shopping list. 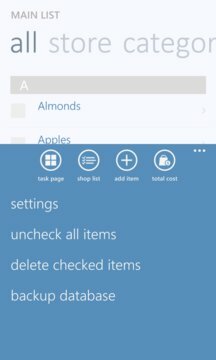 - users can pin the shopping list to start screen. It's a live tile that will let the user know how many items still to buy. 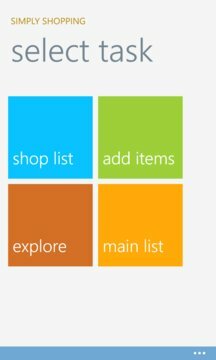 - also can pin every individual store tile/list to the start screen. - can calculate the total cost of items bought in the shopping list. It will show a running total as you check off items in the shopping list. You also have the option to see the total cost by stores. - you can email or text your entire shopping list. You also have the option to email or text just the individual store list. - ability to backup the entire database to OneDrive ( available only in pro version). The concept of this app is very simple. You create a 'main list' which will be your permanent list of items. From the 'main list' you can simply check items to add to your shopping list. You can easily edit any item from anywhere ('main list' or 'shop list') and the changes will reflect automatically everywhere. This is a free version and is limited to 25 items. But, you can unlock it to 60 items by rating this app. Make sure to rate it from one of the links within the app. For full access please check out the pro version (Simply Shopping).